Wedding vows on wedding rings – Engraving techonogy makes a Difference! Presumably, the earliest form of an engraved ring was a plain ring with a word or two scratched on it. Not only the quality of engravings has improved drastically (particularly with laser engraving), but you can also fit a whole lot more on a ring than before! 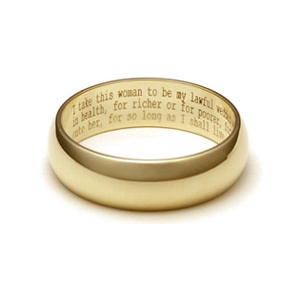 There is a service now allows you to engrave your entire wedding vows on a ring (provided they are not too long, and why should they be? ).